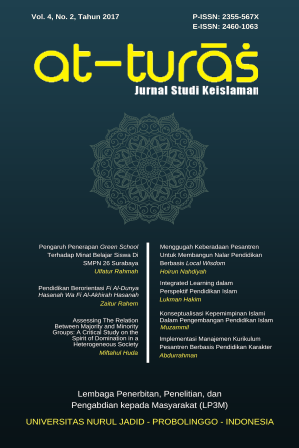 at-turas (ISSN: 2355-567X, E-ISSN: 2460-1063) is a peer-reviewed journal in the field of Islamic Studies, devoting to provide an intellectual athmosphere of new Islamic trends in society and beyond. This journal warmly welcomes contributions from scholars of related disciplines. It is published twice a year (January - June and July - December) by Center for Publication, Research, and Social Empowerment (LP3M) Nurul Jadid University Paiton Probolinggo. Two decades or more, in the global scheme, Islamic studies have been enforced to take broader paradigms from dogmatic-theology to popular-religious. Islamic studies is not merely discussing on sacred corpus only, but everyday life of Islam also. In academic space, this field has increasingly been an intersection -if not a contestation- across disciplines, such as political science, anthropology, sociology, history, economics, media, and cultural studies. This journal, serving as a forum for the study of Islam in Indonesia and other parts of the world within its local and challenging global context, supports focused studies of particular theme and interdisciplinary studies. It has become a medium of diffusion and exchange of ideas and research findings, so much so that researchers, writers, and readers from various traditions of learning have interacted in the scholarly manner. See Google Scholar Profile for at-turas by clicking here.